There are now a number of therapies aimed at helping people with aphasia to produce words more easily and studies show that practising words in therapy can improve subsequent naming of the words in tests of picture naming. Few studies, however, have shown that this improvement makes any difference to producing words more easily in conversation, but this is what matters to the person with aphasia and their family. Positive functional communication outcomes are essential for the demonstration of usefulness of a service to patients. The POWERS provides a quantitative means of measuring an individual's ability to produce meaningful words in natural conversation. It provides guidelines for collection of the conversation, and for analysis of the sample, scoresheets to be completed based on the analyzed sample, and worked examples of conversation data, including audio-files provided on CD. This is a versatile tool that can be used in both research and the clinical setting to analyze whether word-finding improves after a period of therapy. Ruth Herbert is Senior Lecturer in the Deparment of Human Communication Sciences, Univeresity of Sheffield. Wendy Best is a Reader in the UCL Division of Psychology and Language Sciences. 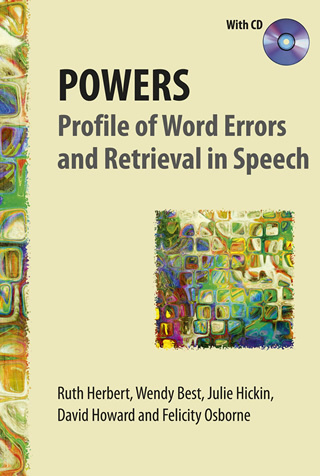 Julie Hickin is a Senior Lecturer in aphasia, School of Health Sciences, City University London. David Howard is Research Development Professor in the School of Education, Communication and Language Sciences, University of Newcastle upon Tyne.